Kits are dyed-to-order. Wizard’s Wardrobe colorway is a tonal color option that is earthy, rich, and inviting. The subtle changes of color create a magical and mystical mood. The dusty and muted colors make this option feel like an antique tapestry that was made from plant-dyed fibers. 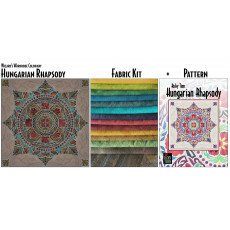 This kit includes 11 yards of Ricky Tims hand-dyed fabric in colors shown to make the quilt top (binding fabric included), the $59.95 pattern for free, plus free-video tutorials beginning May 1, 2018. You will automatically be added to the video tutorial list for email notifications. The Wizard’s Wardrobe variation is created from Ricky Tims 100% cotton hand-dyed fabrics. The suede-like quality of these fabrics is always mesmerizing to anyone who gets up close and personal. The soft hand of these fabrics is remarkable.